Garlic (Solent Wight) on the left, Egyptian walking onions behind, hopefully protecting the Chinese broccoli (kailans) and kohl rabi seedlings. The copper-lined collars prevent slugs and snails from reaching the brassica seedlings. I planted out these heavily guarded brassica seedlings yesterday. Bitter experience has taught me that they need this level of protection. The copper-lined collars are made from sections of 500ml plastic water bottles trimmed with copper tape around the top and will deter slugs and snails. The metal reacts with the mollusc's mucus when it tries to cross the copper strip and gives it a shock-like sensation. I've found these home-made copper rings perfectly effective and use them with brassica seedlings, cucurbit seedlings, lettuces, of course, and also globe artichokes when they are first planted out. I can still remember the heartbreak of coming home after an Easter weekend away and finding my globe artichokes, planted out on Maundy Thursday, had vanished. The only clues to their disappearance were a number of long, ribbon-like, shiny trails. The only drawback really, apart from the need to have as many collars as you have seedlings in the ground at any one time, is that the slug/snail population isn't controlled. In a particularly sluggy year, they will go off to try to find something else to eat that's unprotected. One year I found slugs attacking the beetroot, which is not normally vulnerable. This year, with a wet April with showers interspersed with sunshine, we are on Code Red as far as slugs and snails are concerned. The second level of protection here is the perimeter planting of various alliums. I have deliberately positioned garlic (pictured here is Solent Wight, with elephant garlic out of shot) and onions around the outside of the raised bed to deter cabbage whitefly. Alliums are often planted with carrots to deter carrot fly, as it is said that the onion smell confuses the carrot fly (and also that the reverse holds true, the carrot smell deters the onion fly who is after an allium snack). Here I am hoping that the same principle holds true against whitefly. If this mini-trial proves successful, and the kohl rabi and kailans in the raised bed remain relatively whitefly-free, I will extend it to the main brassica bed, where the cauliflower, broccoli and cavolo nero will be planted later in the summer. Last year, the cavolo nero in particular was horribly infested with whitefly to the point of not being able to harvest it. Copper tape is available from larger garden centres and from a number of online gardening suppliers. It's well worth searching and shopping around as prices can vary widely. Copper rings are also available but tend to be much more expensive while performing exactly the same function as the homemade rings here. For a copper ring with a larger diameter cut sections from a 2l water bottle. 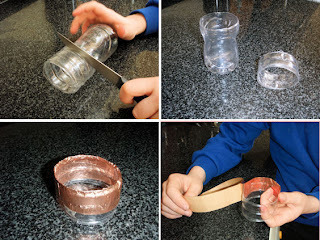 Clockwise from top left: cut an empty water bottle into sections; take the mid-section and line with copper tape, tucking the ends over the rim to make a neat edge.